4th Graders Tour Versailles – Virtually! This past Tuesday morning, Lousi XIV’s France came to the Silicon Valley. 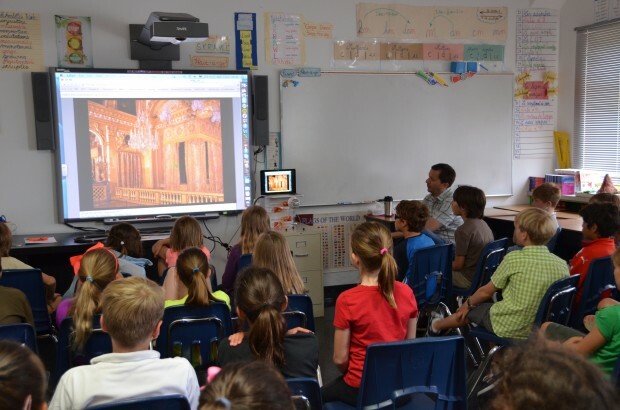 Olivier Monteil’s 4th Grade French class was treated to a digital tour of the Château de Versailles. They visited the Hall of Mirrors, the Appartement du Roi, and the breathtaking gardens surrounding the palace – all without leaving their Cohn Campus classroom. At 8:30 a.m., students connected live over the Internet with a professional guide in Versailles, France, where it was 5:30 p.m. local time. The guided tour was an interactive, multi-media, language immersion experience. In one corner of the screen, students could see their guide’s face as she gave expert commentary in French about the images they were seeing. On the main screen, students saw video streaming live from various points in the palace. The guide was able to zoom the camera in to examine the elaborate art and decorations close-up. Students got to see exquisite tapestries and murals, and Louis XIV’s bed and coat of arms up. The Versailles specialist also used beautiful photographs, movie clips, and period music to recreate the atmosphere of Louis XVI’s royal court. This is the second year that Olivier Monteil has arranged a virtual tour of Versailles for his students. The tour is part of a program subsidized by the French government that runs virtual tours of monuments throughout France. The Versailles tour has proven to be such a valuable learning experience that Olivier is thinking of expanding the program to include more sites next year.